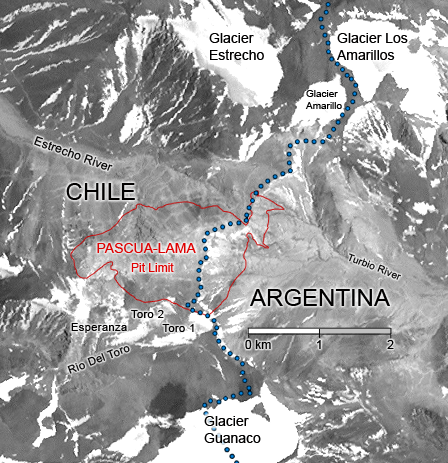 In a surprising move late Monday, a Chilean court revoked the environmental watchdog’s (SMA) decision of imposing Barrick Gold (TSX, NYSE:ABX) the maximum fine possible for violations at the now shelved Pascua Lama project. The resolution, however, not only orders the Toronto-based to keep operations halted, but also brings new challenges to Barrick. This because instead of turning a blind eye to the US$16 million fine charged to the gold giant last year, the environmental court has ruled the SMA's resolution on the project involved several illegalities, especially in relation to the total amount of the fine. Minería Chilena reports the SMA will now have to charge Barrick for each and every of the 23 infringements, instead of grouping them into five categories as it did the first time. Barrick acknowledged 22 of the 23 problems and has said it is working to fix them. It denied, however, that a massive containment wall poses risks and that it needs changes to better protect the valley below. Pascua Lama, which would produce about 800,000 to 850,000 ounces of gold a year in the first full five years of its 25 year life, was scheduled to start production in the second half of this year. Last year, however, Barrick decided to suspend it until conditions improve. The $8.5 billion gold and silver project straddling the border with Argentina was set to become one of the top gold and silver mines in Chile, the world's top copper producer.